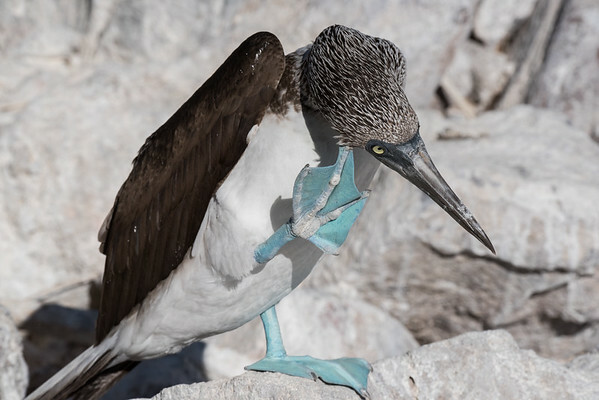 I travelled to the most remote island in Mexico's Gulf of California, Isla San Pedro Martir, to assist a BBC Natural History film crew in documenting the interaction between Blue-footed Boobies and an endemic lizard. 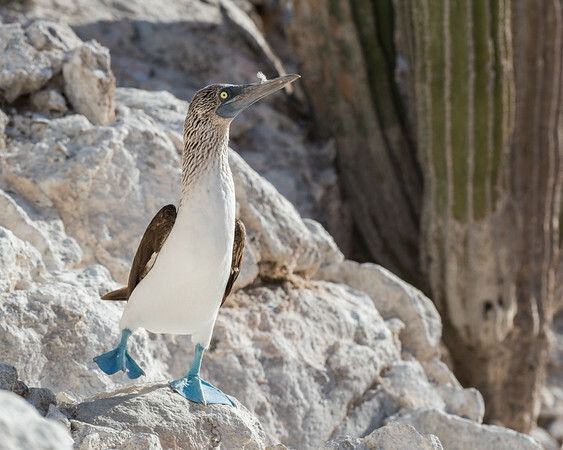 The island is home to one of the largest booby colonies in the world, hosting approximately 200,000 blue-footed and brown boobies in an average year. 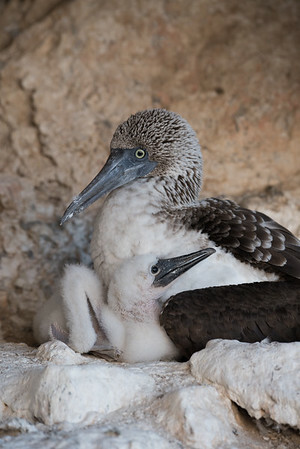 We were there during the birds' nesting season, although the colony had very low nest density due to the impact of ongoing El Niño conditions. 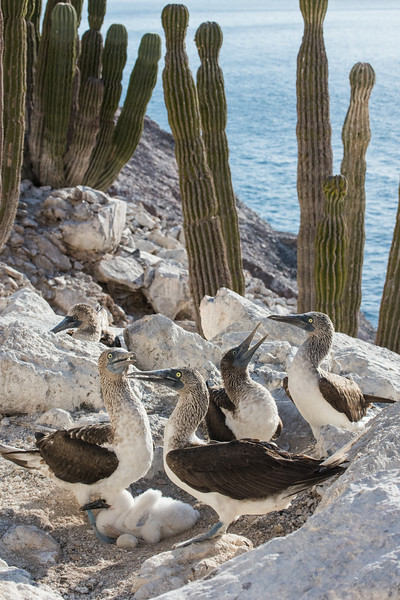 San Pedro Martir was mined for guano in the early 20th century, causing permanent changes to the surface of the island. 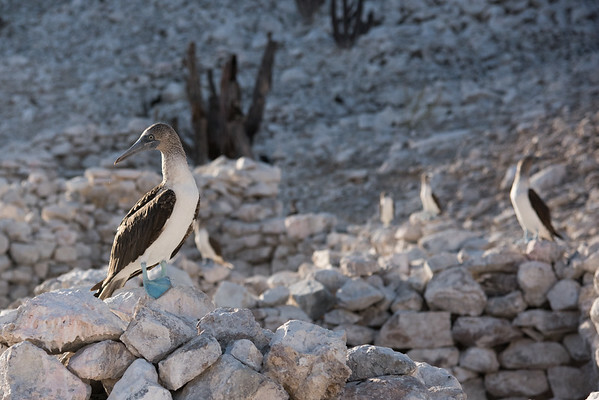 The remains of rock walls built during the mining operations are still present today. 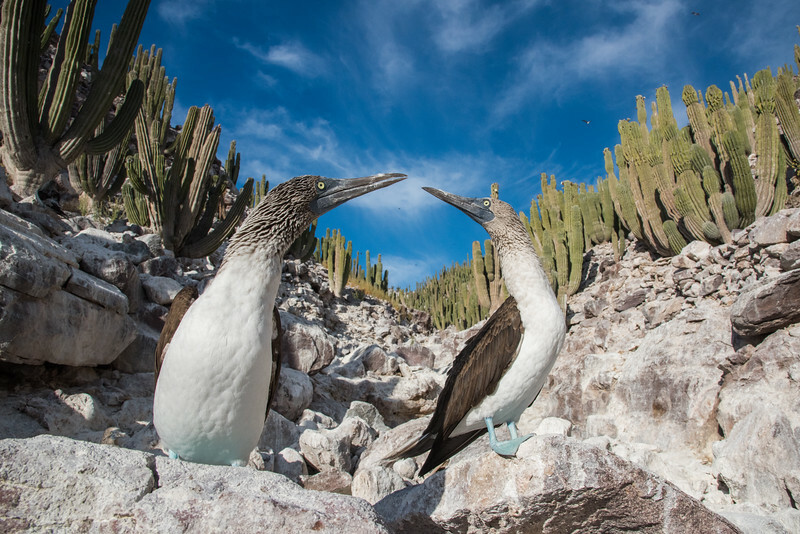 Two courting blue-footed boobies in a dwarf cardon cactus-fringed canyon. 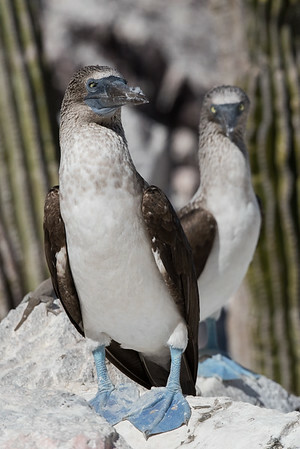 The males have noticeably smaller pupils than the females. 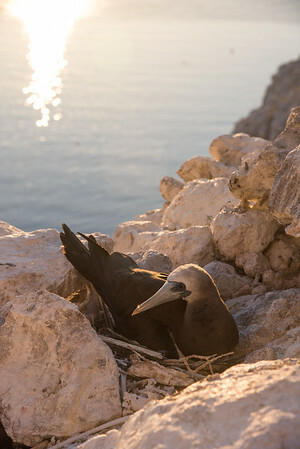 Tens of thousands of brown boobies nest on the island as well. 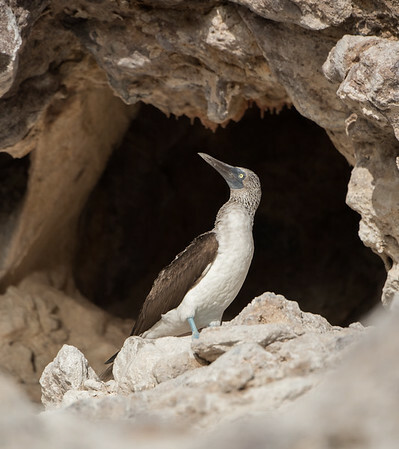 A male blue-footed booby outside a rocky crevice. 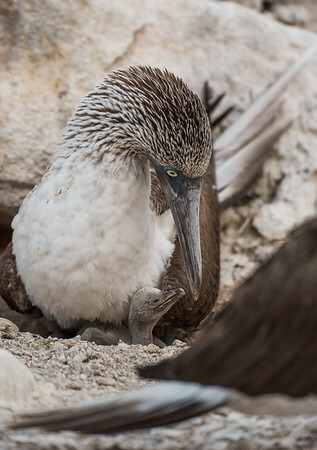 Boobies have asynchronous hatching, meaning the the first egg is produced (and thus first chick hatched) significantly earlier than subsequent eggs. 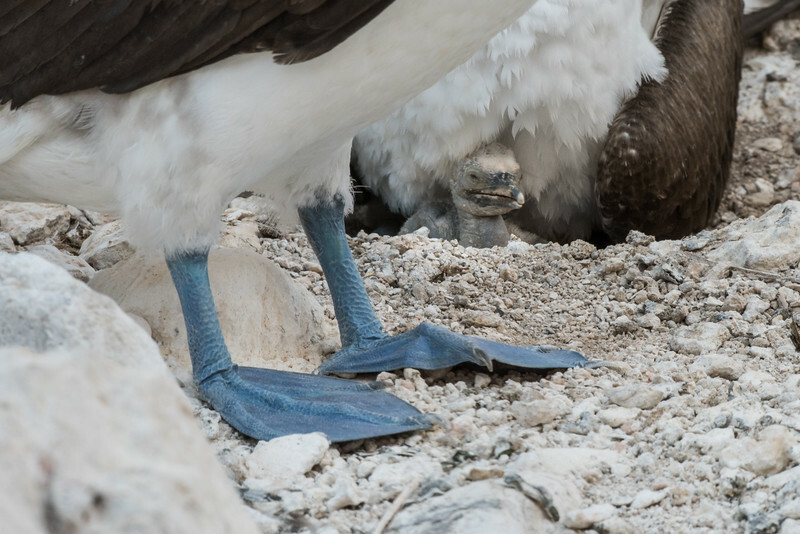 This results in a size disparity between the chicks. 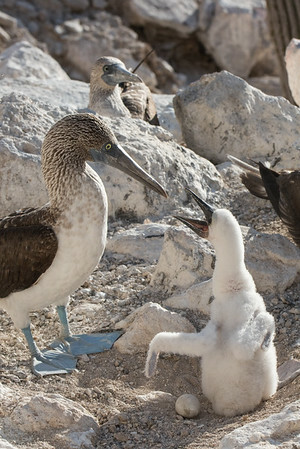 The older chick will often harass the younger. 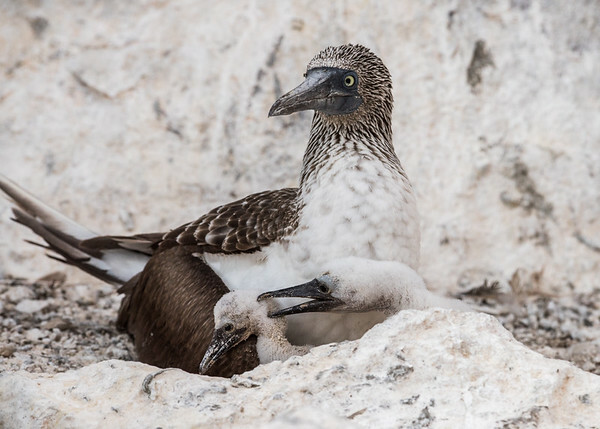 This behavior is not stopped by the adults in the nest. 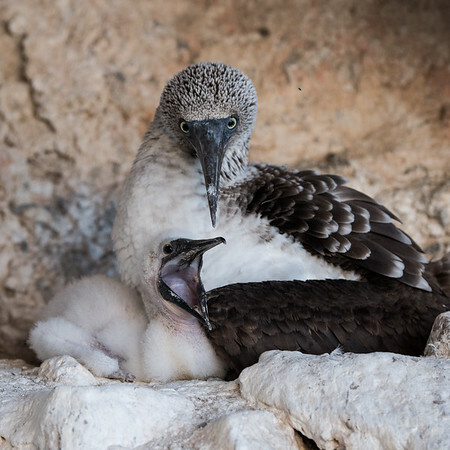 Called facultative siblicide, it may result in the death of younger chicks, especially in times of food scarcity. 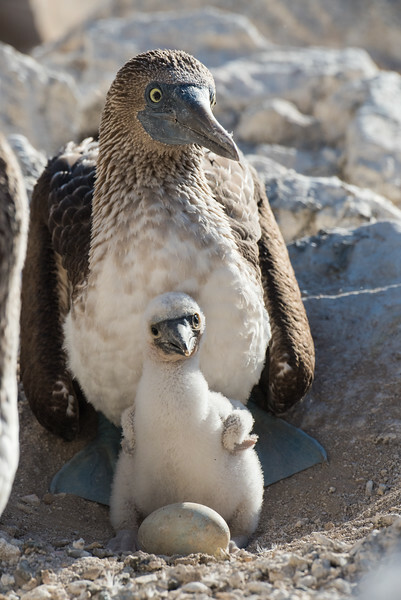 A downy blue-footed booby chick stretching its wings over an unhatched egg in its nest. 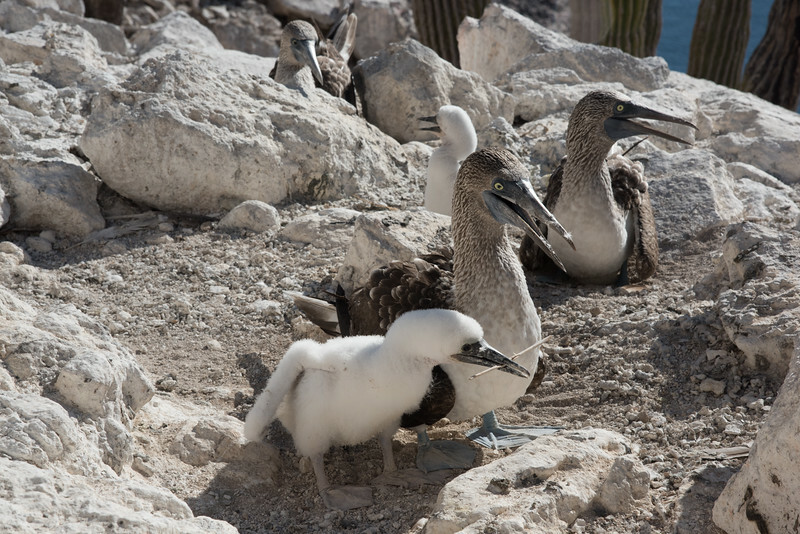 Female, downy chick, and an unhatched blue-footed booby egg. 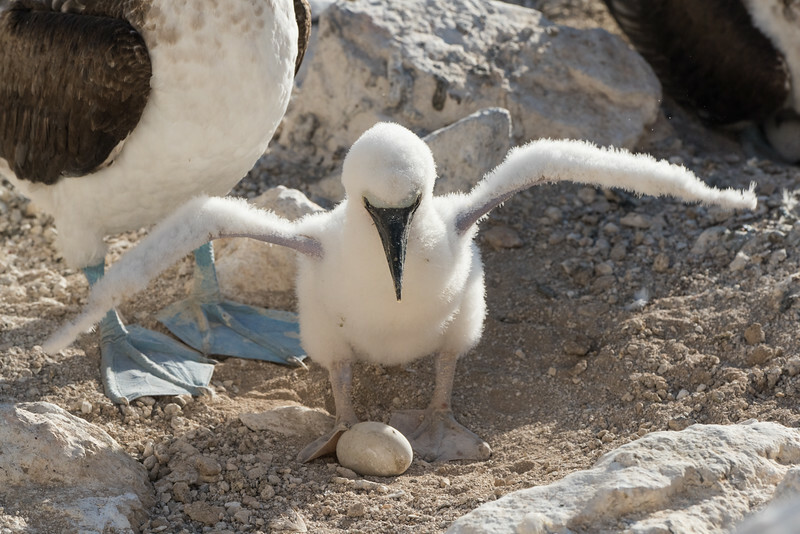 In all likelihood this egg did not hatch. 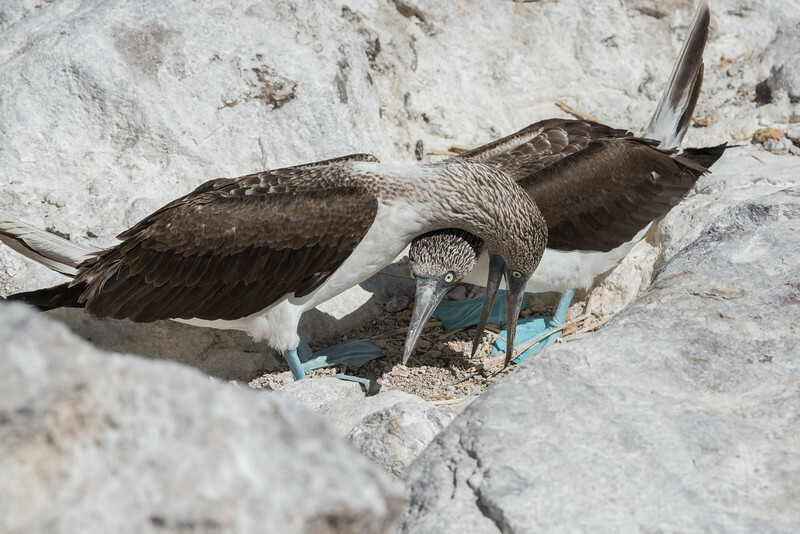 It was a season of severe food shortage due to El Niño conditions, and the parent appeared to have disregarded it. 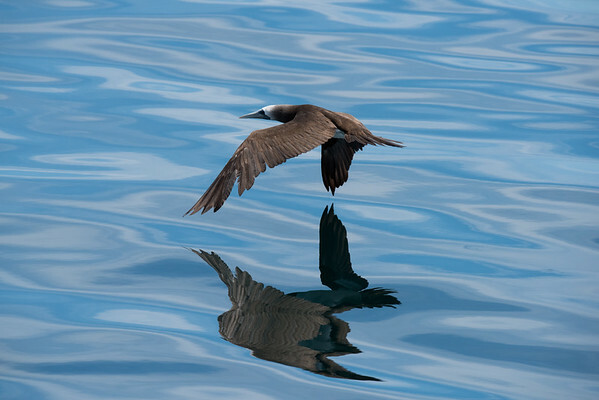 A male blue-footed booby performing courtship behavior. 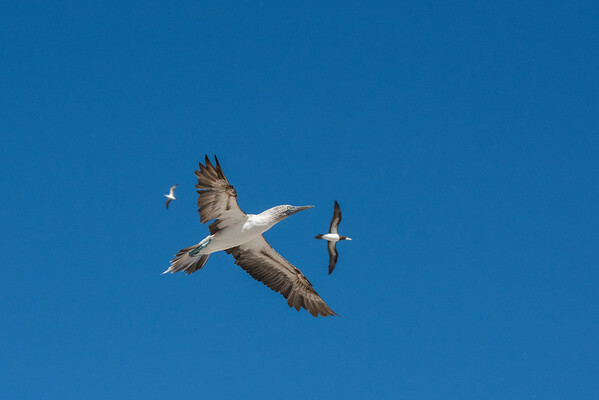 Blue-footed and brown boobies in the sky above Isla San Pedro Martir. 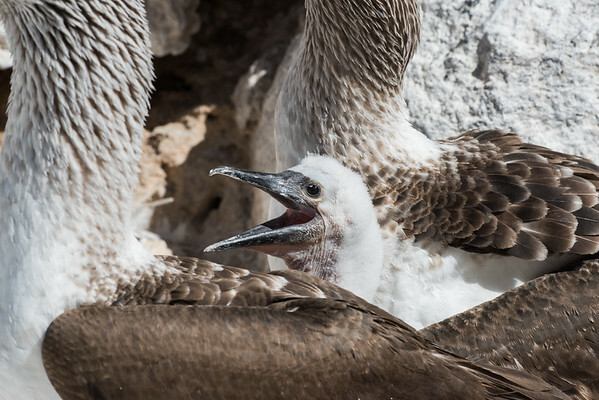 In a typical nesting year, one would expect to see tens of thousands of birds overhead at any moment. 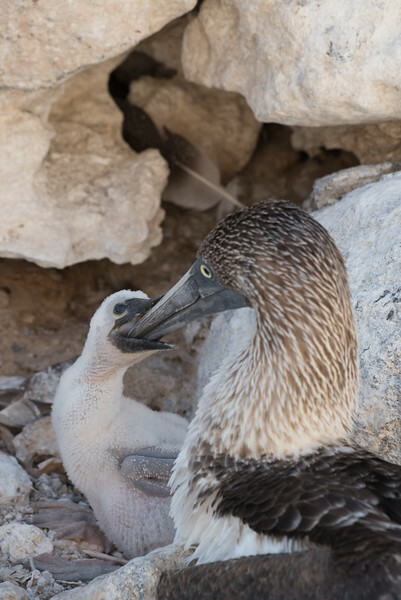 Due to El Niño conditions and a subsequent shortage of sardines (their primary food source), the island was easily quite and had a very low number of active nests. 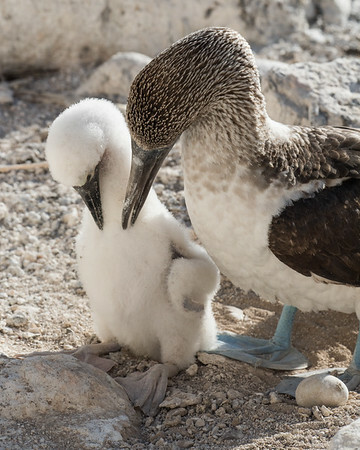 A blue-footed booby helps its chick preen their downy feathers. 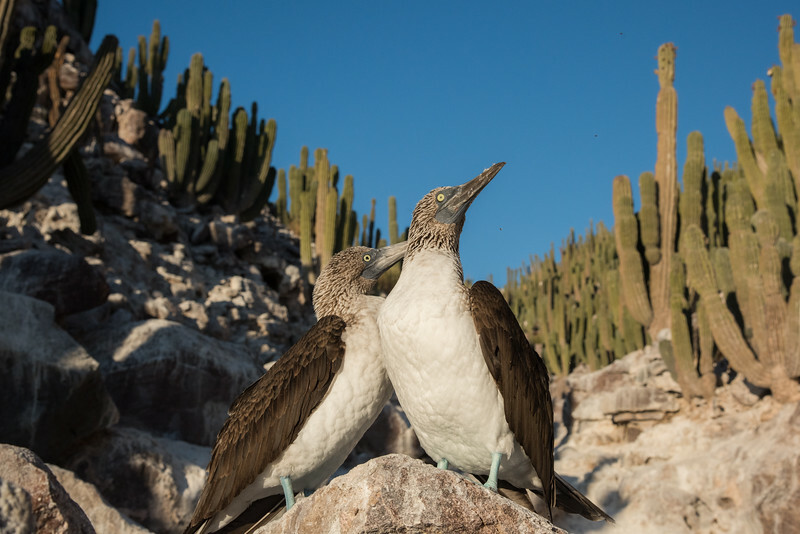 Male and female blue-footed boobies during courtship behavior. 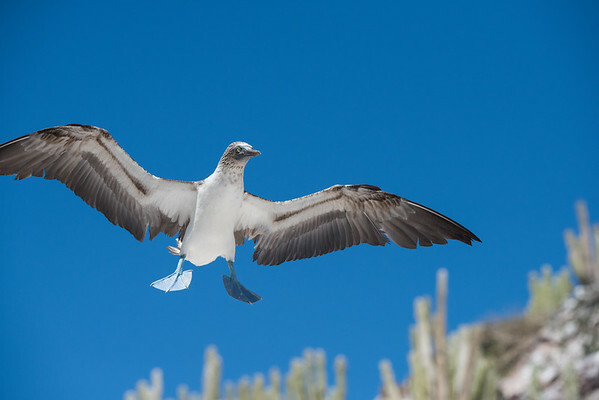 A blue-footed booby coming in for landing in a rocky canyon. 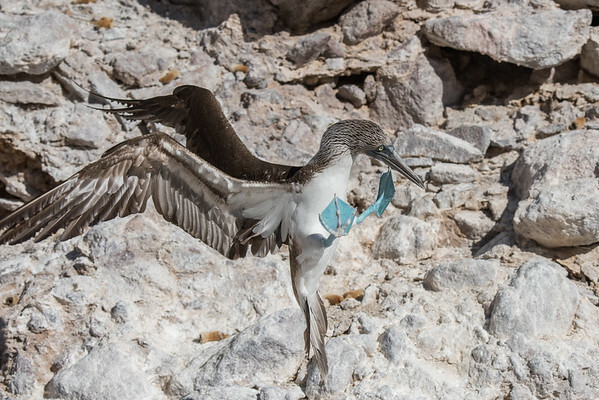 A pair of blue-footed boobies with down stuck to their bills from a preening session. 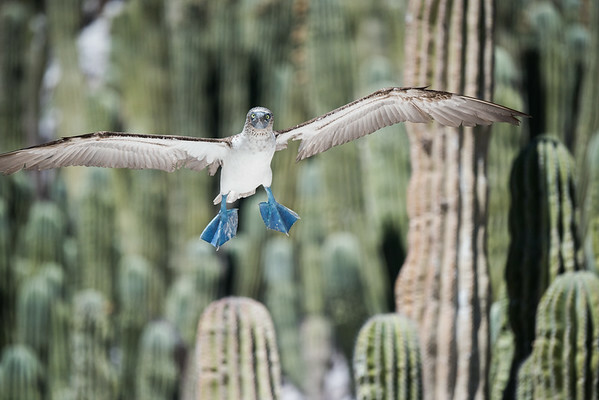 A blue-footed booby flying low in the dwarf cactus-covered portion of the island.